athleticnetwotk@louisiana.edu (Republished from the Spotlight Feature on Former Athletes in March, 2017). This just in — the home run Danyele Gomez hit in the 2003 Women’s College World Series has finally stopped rolling. Investigators located the ball about a mile outside of Oklahoma City and have identified it as the one Gomez ripped against Texas ace Cat Osterman for a 2-1 Ragin’ Cajun lead in that WCWS battle. Truth be told, the screaming line drive shot over the left field fence was actually found that day. But the hit was the kind that spawns legends. Gomez was wrapping up an All-American freshman campaign, barely a year removed from Cabrini High School in New Orleans, and had helped to spark UL’s return to the World Series stage after a seven-year absence. “That home run stands out for me,” said Gomez, who eventually had 83 collegiate shots from which to choose. “My family members were there. My parents, and all four of my grandparents. It was hard for them to make the trip to Oklahoma City, so it was a big deal. The only child of Jimmy and Analyn Gomez gave the family plenty to talk about in her Cajun career. “One time, we were playing at home and it was cold, with the wind in your face,” Gomez said. “We were down by a run and I was the go-ahead run at the plate. I hit a line drive off the board behind the outfield that had all our NCAA years on it. Despite those highlight memories, Gomez wasn’t a Dave Kingman — feast or famine, homer or nothing — kind of hitter. For the record, Gomez had 83 home runs and 588 total bases (both school records), with 283 hits, 209 runs, 246 runs batted in and a .745 slugging percentage. As a senior in 2006, she had 30 home runs, 92 hits, 77 runs, 199 total bases, a .442 batting average and a .957 slugging percentage to secure a third All-American season at UL. She got a hit in 50 of 62 games and scored in 47 of those contests. The Cajuns finished 47-11, 60-8, 51-10 and 50-12 (208-41) with four straight NCAA Tournament berths. It wasn’t all easy, though, no matter how it looked. “I had a rough summer before my first fall at UL,” Gomez said. “I had good experience, but I couldn’t get it together. Going into the fall, I put a lot of work in. “Coach Mike (Lotief) taught the swing differently from what I had been taught my whole life. There was no intermediate. I had to figure it out. He focuses more on the hips than the arms. As women, we’re not that strong in the arms. We’re stronger in the lower half, and need to use that to our advantage. Apparently, though, she was a quick study. 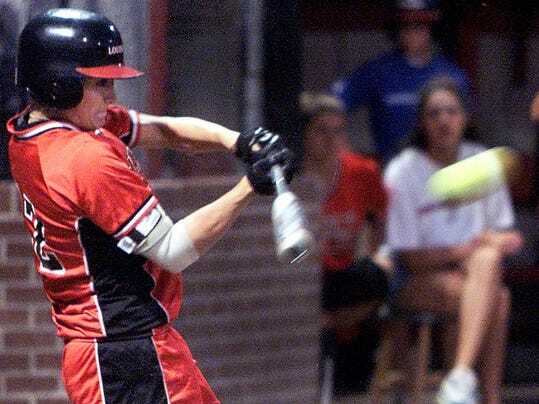 The 2003 Cajuns learned quickly enough to survive a rugged NCAA Regional (6-0 over San Diego State, 1-0 over Fullerton, 1-0 over Oklahoma State, then 2-9 and 6-4 against Oregon) and reach the World Series. They lost to Texas 5-2 and UCLA 5-1, finishing 8th in the country, and never got back to the WCWS despite knocking on the door with Gomez as the low-key leader. “I was always going to put in the work for each team, each season,” she said. “If something was broke, I’d work on fixing it. Everybody has slumps. Everybody has the monkey on their back at some point. “I’m a quiet person, so I guess I led more by example. We’d figure the hitting out, try to work with each other. Each of us had a little part of hitting, but how you understand something might not be the way some others see it. Gomez excelled in softball, volleyball and basketball in her youth, making travel teams in both softball and volleyball and focusing on those two sports at Cabrini. She thought about playing her two favorite sports in college, too, but her academic load as a pre-med major made that too ambitious. Gomez grew up with athletics, as both parents were active. And it went beyond parental influence. Gomez headed for medical school, then switched to nursing school. She spent four years in neo-natal care, then went back to school to become a nurse anesthetist. Married last September, Gomez and her husband Christopher McDuff live in New Orleans, close to her parents. Jimmy and Analyn were there every step of the way — and nearly every game — growing up, so there’s no reason to change a winning formula. That includes future McDuffs. Gomez doesn’t hit tape measure home runs any more, but she’s still hitting life’s challenges out of the park. “It seems like yesterday, but it’s been a while,” she said.